I was nine years old, and once again I’ve skirted the edge of the golf course behind our house to go to the tree. My special place was in the willow tree that bordered the straight, long fairway of the seventh hole. It was behind Maureen Dzialga’s house. She was my best friend, and the one who had the hip, stylish mom, Lori, who made the other moms on Willowgrove look like they were half-hearted replicas of what they saw in the Saturday Evening Post. Not Lori. Lori had flare. She was outlandish, with a laugh that erupted like it couldn’t wait to escape; she, the creator of new words by combining two similar ones; like “flustrated” and “discussment”. She, who sometimes pronounced her polish surname with a breathy, “Jjalga”, and at other times, added a second “l” – “Jjalgla”, for no apparent reason. Recently widowed, with five kids under the age of eleven, I remember the funeral. How shocked we all were at her choice of dress – bright canary yellow with a broad vertical white stripe down the center, spikey yellow heels. And then her choice of songs, “To Be Alive”, that zippy song with lyrics: “To be alive, and feeling free, and to have all men in our family. To be alive, in every way. Oh how great it is to be alive.” That song? At the funeral of her 35-year-old husband’s sudden death from a heart attack? Wow, that took courage or a different perspective than what most of us held. I was drawn to Mrs. Dzialga; I admired her zest, her casual credos, her new kitchen and bedroom color schemes every three years just because; her courage to walk through the world outside the well-prescribed path that was expected for a mother and a house wife. I didn’t have that capacity at nine; I didn’t have it at 25. Not even at 37. But by then at least I had woken up to the reality that I had lived almost four decades walking precisely down the centerline of the “expected path”; the path of so-called success that led to titles, status, money and minions. But at what cost? Sometimes it felt like a ragged deterioration of my soul; an estrangement from my heart. I wonder now why I didn’t listen better to the kennings of the willow; the tree who graciously allowed me to climb her solid, low-hanging boughs. There, enveloped inside her curtains of lacy green, I gossiped with Maureen about school, or the boys on my dad’s baseball team, because naturally we were in love with most of them. I begged my mom for a “training bra” for my flat girl’s chest, and wore a sleeveless white cotton blouse to every baseball game that year in the hopes that the 14 and 15 year old Tommy Stefans, Mark Kaltriders and – gasp – Roby Biaccos on the team would know that I was old enough to wear one. In spite of these distractions, my nine year old heart knew by instinct there was sanctuary in that tree; security, beauty and room to dream. But it didn’t know – I didn’t know – that there was an opportunity to listen, and to learn from the wind that whispered as it stirred her graceful branches. And by listening then, I’d have heard my own inner longing to be my version of Mrs. Dzialga – wild and slightly irreverent, shocking, untamed, uncoiffed, un-usual. Like Annie, in Annie Get Your Gun. After years of picnics and secret conversations in the willow tree, one day, like Little Jackie Paper, I stopped going to my special place. Years later and mid-way through my high-pressure engineering school, I looked out our kitchen window at the golf course. I suddenly remembered the tree that had been my hiding spot as a girl. I craned my neck, eyes searching, searching. The willow was gone! I was stunned that I hadn’t noticed for so many years. But I was also already so disconnected from nature by then, that I felt only a little pang. I shrugged it off, my mind busy with the struggles of trying to be taken seriously as a skinny, high-voiced engineering intern in a hot, grimy Chevrolet Forge plant. It is only now that I realize the willow tree was my puff the magic dragon. Or perhaps my Honahlee. A place of innocence; a place of the possible. The beginning of spring in one’s life is youth. 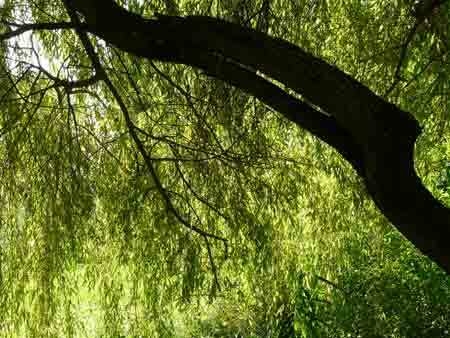 It seems no accident I was drawn into the willow’s world then. I imagine that Honahlee must have had groves and groves of willows, like the groves for which my neighborhood was named – Willowgrove. Now, after the trappings of success have lost their allure; now, after I’ve come to remember the unbounded wisdom to be experienced in nature, I long to return to Willow of the goddess; Willow of the feminine. I love this, Jen. For me it was a pine tree and when I go to my parents home I looked out over what once was a beautiful field to the Horizon beyond where that tree might still stand. The path to it is overgrown and impossible to get through – like a bramble jungle. But you’ve given me the desire to get through there and go searching for my tree. Thank you for this. I love you.